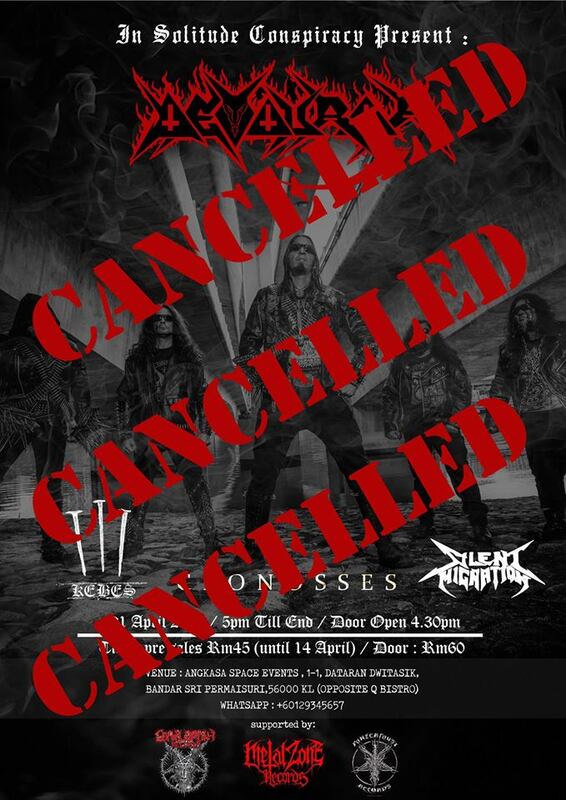 Kuala Lumpur— A concert from Singapore’s black metal band Devouror that had been scheduled for April 21, Easter Sunday, has been cancelled in the wake of a complaint lodged in Putrajaya from the Council of Churches of Malaysia (CCM). Goatlordth Records, the organiser of the event, confirmed that the Singaporean band’s debut concert had been cancelled, since the company does not wish to get into trouble with the authorities, nor cause harm to anybody. In Goatlordth Records’ Facebook account, the company wrote, “we are devastated that the Devouror’s Kuala Lumpur debut show has to submit to its fate of cancellation. As organiser, we are frustrated that almost a year of effort has been suppressed to nothing, as we intend no harm or beef with the righteous authority. On Monday, the Secretary-General of CCM, the Reverend Dr Hermen Shastri, issued a statement on behalf of the council asking the authorities to explain why they had given permission for a Singaporean black metal band to hold a concert on Easter Sunday, April 21, one of the most sacred days in the Christian faith. The live concert was scheduled to take place at a venue in Kuala Lumpur. It has come to the attention of the Council of Churches of Malaysia (CCM) that the Singapore based Black Metal Music band will be holding a live concert on the 21st April in Kuala Lumpur. The band formed in 2018, prides itself in carrying lyrical themes that are anti-Christian and pro-Satanic. The CCM calls upon the relevant authorities to explain the basis for granting permission to such bands that promote their music using extremely offensive and denigrating language that can hurt the religious feelings of others. On top of that, the live performance of the band will be on one of the holiest days of the Christian calendar, namely Easter. This will be considered an affront to the religious sentiments of Christians in the country. The cancelled concert had been called “KL for Satan,” after the band’s recently released Slay for Satan, which has been distributed in Malaysia. The cancellation of Devouror’s concert is similar to the decision made in Singapore early last month when the concert of Swedish black metal band Watain was cancelled just a few hours before the intended schedule. Although the country’s Info-comm Media Development Authority had given permission for the band to play at Ebenex Live Space in Paya Lebar only for fans who are aged 18 and older, the Ministry of Home Affairs later cancelled the performance over concerns of the band’s songs which promoted violence and disparaged religions. The possibility of upsetting social harmony in Singapore was sufficient reason for canceling the concert. Goatlordth Records expressed its disappointment even further on its Facebook page. “To label and simply categorize the fans of extreme music as ‘a bunch of cults’, ‘religion hating pr***’ or ‘dirty liberals’ is truly unfair to many levels. At this age, extreme music has already become a medium to connect so many people around the world from trading of physical music to open-air festivals. Here in our beloved motherland, it is not as luxury as it is in Europe, in which open-air festivals of extreme music are being held at massive scale with full consent of their local authority. We, the fans here are definitely aware of this situation and we are probably asking too much to ask for a huge open-air extreme music festivals to be held here. We are also aware that many will start to tell the fans of extreme metal to ‘go look for other interest’, in order to steer away from issues like this. However, if they think with discretion, passion is not something you simply suppress in someone. Many of the fans of extreme music are also pillars of the society. Many of them are competent professionals and are best at their field. Many are also devoted followers of their religion(s) whom many others have massive respect for, as individuals. Therefore, to belittle the fans of extreme music with shameful judgment is a scrutiny of your own personal values.